Appearance: Bob dresses quite similarly to the other Temmie. He has fluffy long black hair and soft white fur. He always wears a blue sweater. For now! Who knows what Bob could wear out in the world! He's as likely to wear a lamp shade as a fancy dress or a watermelon. Personality: Bob is different from other Temmie. He can speak in full sentences and has a decent attention span. 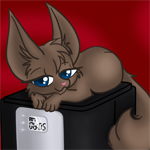 Though he still succumbs to a few of the normal Temmie quirks like loving tem flakes and having his face vibrate furiously when excited, he's notably different. Bob loves his fellow Temmie and doesn't even acknowledge the fact he's smarter than them. To him, Temmie are just the best! Bob isn't satisfied with staying in the Temmie village forever. Nope! Bob wants adventure! He likes the Temmie life but he wants to see how everyone else lives! Bob has an unrivaled passion for trying new things and jumping recklessly into whatever situation he finds. However, when Bob gets sad, his mind starts to revert to fooll tEMMIE!!! hOI!! It's a defense mechanism for Bob to separate himself from any heartache. He'll just be like all of his carefree friends back home. 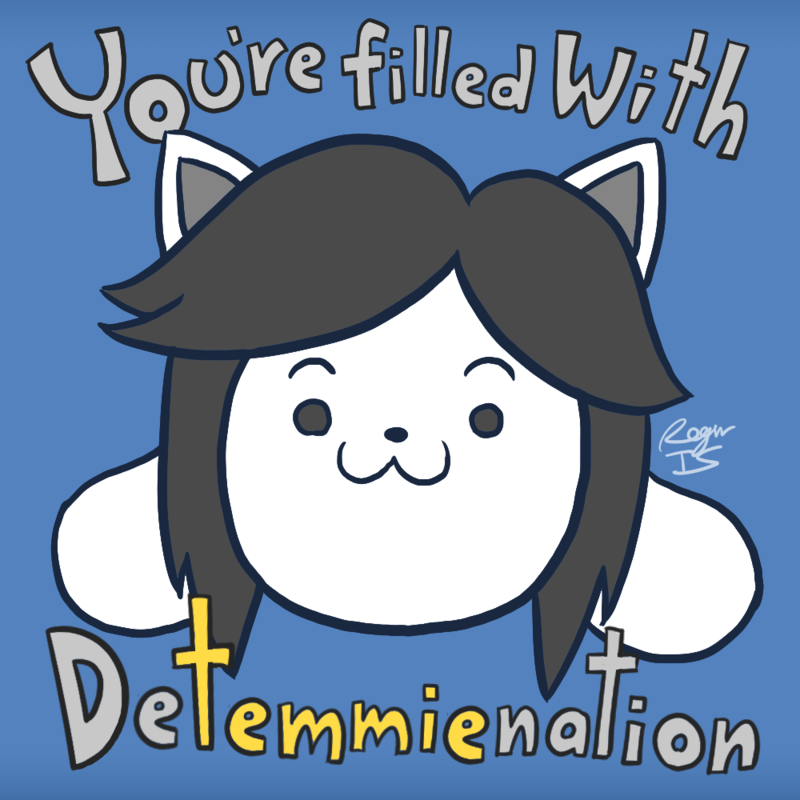 Background: Ever since he was a little tem, Bob knew he was different from the other Temmie. Maybe because he could speak better and had a different name. Whatever set him apart from them didn't set him apart from them. He was still a Temmie and they still treated him as one of their own. As Bob grew older, he started to wonder about the world around them. What lay outside the Temmie village? What fascinating things were out there? He made himself a promise. Bob was going to see the world and try everything! Then, he'd bring his knowledge back to the Temmie and be a hero! Armed with a tiny wooden sword and his blue sweater, Bob prepared to face the Underground! Powers: Bob can swing a very slow white sword strike towards his enemy or send a vibrating Temmie face at them. However, if someone makes him sad, he reverts to a normal Temmie and can be dealt with as such. The RP group is actually On Discord!